You're not alone. Many people love bacon. Bacon has that beguiling combination of a delicious aroma, mouth-pleasing fat content, and a salty, slightly sweet but still meaty flavor. Simply thinking about the smell of frying bacon might be enough to get your mouth watering. Bacon is traditionally associated with breakfast, when it's usually served alongside an egg or two, or as one of the hallmark ingredients of a BLT. But you can find bacon on burgers, in appetizers, on salads, and even covered in chocolate or added to ice cream. The temptation to eat bacon can be difficult to ignore. Eliza Barclay at National Public Radio even described it as the "gateway meat for vegetarians" because it seems to be the one meat that conquers the best intentions of many non-meat eaters. Unfortunately, bacon doesn't have a lot of good nutritional value. It does contain some choline, which is needed for brain health, and some monounsaturated fatty acids, which are good for you, but it's also high in the saturated fats that are associated with cardiovascular diseases, as well as sodium, which can be a problem for some people who have high blood pressure. As far as calories, one typical strip of bacon has about 40, which isn't bad, but the calories can add up quickly when you eat multiple pieces. Fried bacon also has more heterocyclic amines than any other meat. Heterocyclic amines are associated with an increased risk of some forms of cancer. 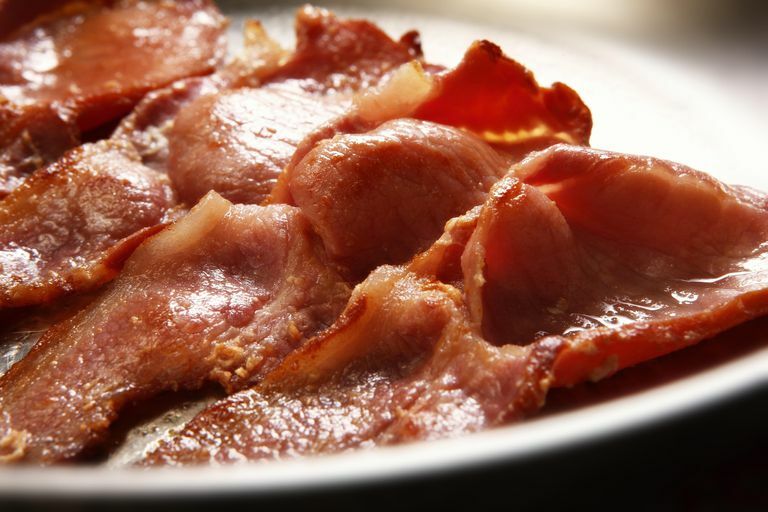 It's a processed meat so bacon has added flavorings and preservatives, such as sodium nitrite, which may also be linked to a greater risk of some types of cancer. Fortunately, adding vitamin C (ascorbic acid) to bacon during processing cancels out the adverse effects of sodium nitrite. Several observational studies point to a correlation between heavy consumption of processed meats and ill health. But to be fair, people who eat large amounts of processed meats like bacon also tend to have poor diets in general, drink more alcohol, are more likely to smoke, and are usually less active. It's difficult to know exactly how bad eating large amounts of bacon (or any particular type of processed meat) is for your health, but I think it's safe to assume that bacon isn't ​good for you. The best way to keep bacon in your diet is to use it as a condiment rather than the main part of your meal. You can also buy turkey bacon that's lower in fat than regular bacon, but the flavor and texture just aren't the same as regular pork bacon. Since bacon has a strong flavor, you don't need to add much to your dishes. You can sprinkle some crisp crumbled bacon on a green salad or use it as a flavor-adding ingredient in cooking. In addition, be sure to choose dishes that call for healthy ingredients. Centers for Disease Control and Prevention. "Sodium Fact Sheet." Paluszkiewicz P, Smolinska K, Debinska I, Turski WA. "Main Dietary Compounds and Pancreatic Cancer Risk. The Quantitative Analysis of Case-Control and Cohort Studies." Cancer Epidemiol. 2012 Feb;36(1):60-7. Pan A, Sun Q, Bernstein AM, Schulze MB, Manson JE, Stampfer MJ, Willett WC, Hu FB. "Red Meat Consumption and Mortality: Results From 2 Prospective Cohort Studies." Arch Intern Med. 2012 Mar 12. Puangsombat K, Gadgil P, Houser TA, Hunt MC, Smith JS. "Occurrence of Heterocyclic Amines in Cooked Meat Products." Meat Sci. 2012 Mar;90(3):739-46. United States Department of Agriculture, National Nutrient Database for Standard Reference Release 28. "Nutrient data for 10862, Pork, Cured, Bacon, Cooked, Pan-fried."